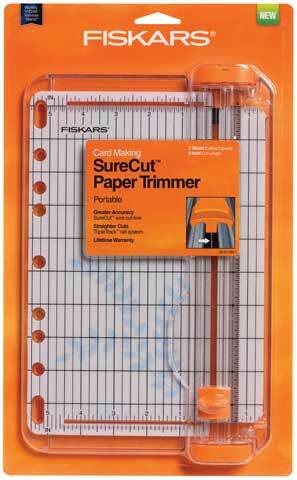 This compact and portable 9" paper trimmer features a wire cut-line that indicates exactly where the blade will cut. The triple track blade and rail system interlocks the blade and rail for straight, precise cuts. The scale and grid cutting mat, printed on the bottom so that it will not wear off, helps ensure cutting accuracy. The ergonomically-designed, high-profile blade carriage is easy to grip and allows accurate quick cuts. It also has rubberized feet to keep the base stable and in place. The lightweight, compact design with built-in three-ring binder holes makes portability easy.